CHULA VISTA (KGTV) -- An 18-year-old motorist is fighting for his life Sunday following a solo-vehicle crash in Chula Vista. 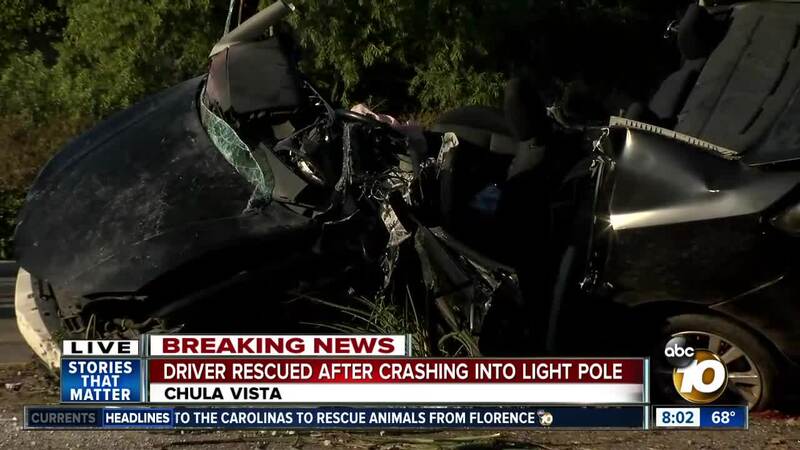 Police said the driver was traveling eastbound on Olympic Parkway at around 5:30 a.m. when he lost control and slammed into a light pole in the center divide near Heritage Road. The impact split the car in half and caused part of the pole to become embedded in the vehicle. Crews worked for nearly hour to rescue the teen from the wreckage because of the live wires that surrounded the car. The teen was rushed to nearby Mercy Hospital with life-threatening injuries. No further information was issued at this time. The crash remains under investigation and it does not appear that alcohol or drugs were a factor in the crash at this time, police said. Olympic Parkway between Heritage Ave. and Brandywine Ave. has a speed limit of 50 miles per hour. However, there are no stoplights on the 1.7 mile stretch of road, increasing the potential for high speeds. The area has a history of dangerous driving and deadly crashes.